The coming decades promise to be the Asian Century, when the most populous region, with some of the world’s fastest growing economies, is likely to become the global nexus of commercial, cultural and geopolitical activity. For this reason, how people in the Asia-Pacific region, including Australia, see each other and their leaders is of growing importance. Overall, despite historical and territorial frictions, Asia-Pacific publics tend to view their regional neighbors in a positive light, with Japan judged most favorably. But these same publics also express limited confidence in the region’s most prominent national leaders when it comes to their handling of international issues. These are some of the findings from a new Pew Research Center survey of 15,313 people in 10 Asia-Pacific nations and the U.S. conducted from April 6 to May 27, 2015. A median of 71% in the region have a favorable view of Japan, with positive views exceeding negative sentiment by more than five-to-one.1 A median of 57% voice a favorable opinion of China. Roughly half (51%) see India in a positive light. And just under half (47%) give South Korea a thumbs-up, in part due to a higher proportion of those surveyed who express no opinion. Nevertheless, favorable views of South Korea outweigh negative sentiment by two-to-one. Asia-Pacific publics have more mixed views about each other’s leaders, in part due to their lack of familiarity with them. A median of 47% have confidence in Chinese President Xi Jinping to do the right thing regarding world affairs.2 A median of 43% have confidence in Japanese Prime Minister Shinzo Abe’s handling of international issues, with more than twice as many expressing support. But just 39% voice confidence in Indian Prime Minister Narendra Modi’s role on the world stage. The share with positive sentiment about Modi is again larger than those with negative views, but a relatively high proportion of respondents voice no opinion, a testimony to Modi’s low public profile in the region. Publics in the Asia-Pacific region generally see each other favorably, with a few exceptions that reflect deeper historical antagonisms, especially between China, Japan and South Korea. Japan enjoys a relatively positive image, except in China and South Korea. Eight-in-ten or more Malaysians (84%), Vietnamese (82%), Filipinos (81%) and Australians (80%) express a favorable opinion of Japan. About seven-in-ten Indonesians (71%) agree. Such views are largely unchanged from 2014, except in Malaysia where favorability of Japan increased 9 points since 2014. As a point of comparison, 74% of Americans voice positive sentiments about Japan. But long-standing historical animosities and recent territorial tensions are evident in Chinese and South Korean views of Japan. Just 12% of Chinese and 25% of South Koreans express favorable views toward Japan. And 53% of Chinese say they have a very unfavorable assessment of Japan. Both the Chinese and the South Koreans believe that Japan has not apologized sufficiently for its military actions in the 1930s and ’40s, according to a 2013 Pew Research Center survey. 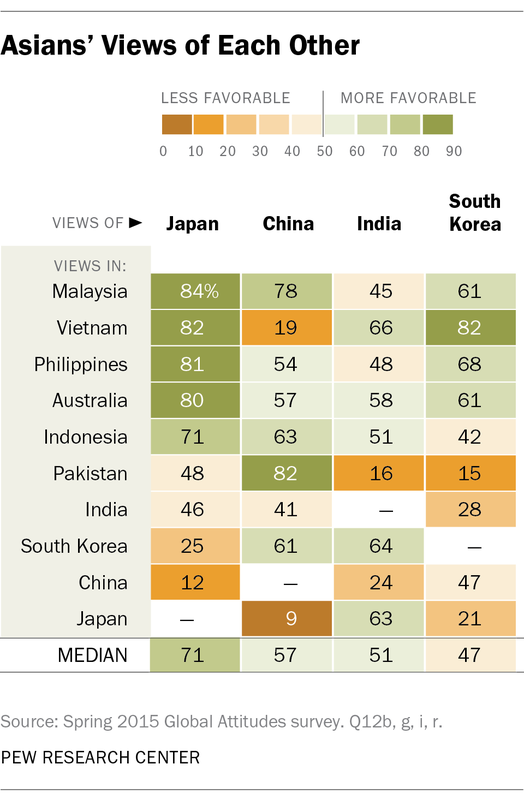 Notably, more than a third of Indians and Pakistanis say they have no opinion about Japan. In four nations, there is a significant generation gap in views of Japan. Respondents ages 18 to 29 are more favorably disposed toward Japan than people ages 50 and older in South Korea (a 34-percentage-point differential), Vietnam (24 points), Indonesia (16 points) and China (11 points). Those with the most positive view of Japan are young Vietnamese (59% very favorable). The most anti-Japan are older Chinese (55% very unfavorable). A majority of people in the Asia-Pacific region who were surveyed, not including the Chinese, have a positive view of China. (For more views on China, see this June 2015 Pew Research Center survey.) Roughly eight-in-ten Pakistanis (82%) and nearly that many Malaysians (78%) voice a favorable opinion of China. About six-in-ten or more Indonesians (63%) and South Koreans (61%) agree. Public views of China have improved in the past year in the Philippines (+16 points) and India (+10 points). However, the Vietnamese (only 19% favorable) and the Japanese (9%) do not see China in a positive light. In fact, almost half the Japanese (49%) express a very unfavorable view of China. Asia-Pacific views of China are far more positive than the perception held by Americans. In the United States, only 38% have a favorable opinion of China. Contrasting Asia-Pacific views of China may in part be explained by differing levels of concern about regional territorial disputes with Beijing. 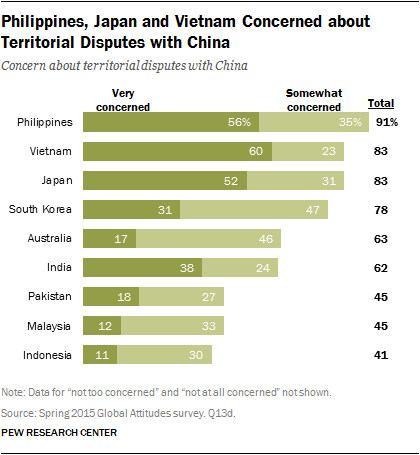 The Filipinos (91% concerned), Vietnamese (83%) and Japanese (83%) are the most troubled by these territorial frictions, according to a 2015 Pew Research Center survey of Asia-Pacific perceptions of various global threats. And they are also the three countries in the region with the highest unfavorable ratings of China. Roughly half of those surveyed have a favorable view of India (median of 51% not including Indians). This includes more than six-in-ten Vietnamese (66%), South Koreans (64%) and Japanese (63%). But only 24% of Chinese and 16% of Pakistanis see India in a positive light. These views of India are generally unchanged from last year. The most upbeat about India are the Vietnamese, but even there only 22% say they feel very favorably toward India. The most intense anti-India views are in Pakistan, not surprisingly given the long, fractious Indo-Pakistani history. In Pakistan, 56% see India very unfavorably. In comparison, 63% of Americans hold a favorable opinion of India. The younger generation of Asians is quite enamored with India. About seven-in-ten Vietnamese ages 18 to 29 (72%) have a favorable view of the world’s second-most-populous and fastest-growing large economy, as do 67% of young Japanese. This compares with 77% of young Americans who see India favorably. The respondents most critical of India are older Pakistanis (80% unfavorable). These are people who experienced, or whose parents experienced, the traumatic 1947 partition of India and Pakistan. South Korea’s favorable rating is the lowest of the four Asian nations tested. This is in part because 65% of Pakistanis and 52% of Indians expressed no view of South Korea. Nevertheless, 82% of Vietnamese see South Korea in a positive light, as do roughly six-in-ten or more Filipinos (68%), Malaysians and Australians (both 61%). But only 21% of Japanese and 15% of Pakistanis agree. The Japanese are, in fact, quite harsh critics of South Korea: Nearly a third (32%) of the Japanese voice a very unfavorable view of their neighbor. And positive views of South Korea in Japan are down sharply, from 57% favorable in 2008 to 21% in 2015, possibly a reflection of unresolved tensions over “comfort women” during World War II. In comparison, 60% of Americans see South Korea in a positive light. South Korea enjoys particular popularity among younger Asians: 93% of Vietnamese, 74% of Filipinos and 68% of Malaysians ages 18 to 29 express a favorable opinion of the country. Across the Asia-Pacific region, none of the major national leaders tested – Chinese President Xi Jinping, Japanese Prime Minister Shinzo Abe and Indian Prime Minister Narendra Modi – garner majority support. But regional medians mask widely disparate assessments of the three by individual countries. Xi’s strongest supporters are in Malaysia (72%) and South Korea (67%). Some of the Chinese president’s biggest fans are South Koreans (81%) ages 50 and older and Filipinos (59%) ages 18 to 29. 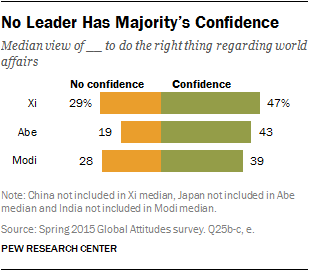 Just 12% of Japanese have confidence in Xi, with 82% voicing no confidence. And Vietnamese ages 18 to 29 (71% no confidence) also distrust him. Abe enjoys the confidence of a median of 43% of the publics surveyed, not including Japan. His strongest support is in Malaysia, where 73% say they believe he will do the right thing regarding world affairs. Nearly as many in Vietnam and the Philippines (both 68%) agree. Abe’s biggest supporters are in Vietnam, where 78% of men and 77% of those ages 18 to 29 express confidence in him. But neither the South Koreans (7% confidence) nor the Chinese (18%) are big fans of Japan’s leader. In fact, 63% of South Koreans say they have no confidence in Abe at all. 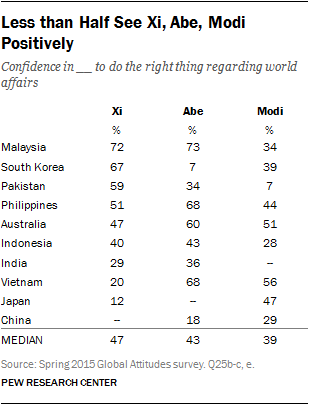 A median of 39%, not including India, have confidence in India’s Modi to do the right thing regarding world affairs. In only two countries – Vietnam (56%) and Australia (51%) – do half or more of those surveyed express faith in Modi’s handling of foreign policy. Modi’s greatest support outside of India is among younger Vietnamese (60%). Not surprisingly – given India’s fractious relationship with Pakistan and Modi’s leadership of the Hindu nationalist Bharatiya Janata Party (BJP) – just 7% of Pakistanis, most of whom are Muslims, have confidence in Modi. Roughly half of Pakistanis (52%) have no confidence in Modi at all. And his lowest backing is among older Pakistanis (64% no confidence). But, overall, Modi suffers from a lack of recognition. A quarter or more of respondents in six of the nine countries surveyed voiced no opinion about him as a leader. There are some gender differences in how many people in the Asia-Pacific region view each other and their leaders. But much of this may be attributable to very high levels of nonresponses among the women surveyed. However, there are striking gender gaps in Australia on views of major Asia-Pacific countries and leaders. 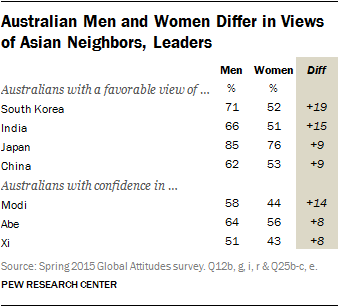 Australian men are far more likely than women to have a favorable view of their neighbors and are more likely to have confidence in their leaders’ handling of world affairs. There is a 19-percentage-point differential between Aussie men’s views of South Korea (71% favorable) and Aussie women’s opinions (52%). There is a 15-point gender gap in views of India (66% of men, 51% of women). Similarly, far more Aussie men (58%) have confidence in Indian Prime Minister Modi than do Aussie women (44%).